Learn if Porcelain Veneers in Gramercy Park Permanent Today! If you’re trying to cover up chips, cracks, misalignment, gaps, discoloration, or other imperfections in your smile, there are few cosmetic treatments as effective as porcelain veneers in Gramercy Park. Trust us when we say these are not the same as the veneers you may have heard about decades ago. However, you may be wondering if these veneers are designed to be permanent. After speaking with your dentist, we’ve found an answer, as well as ways on how to make them last. Porcelain veneers are designed to last for many years at a time, but that doesn’t mean they will last forever. With proper care, porcelain veneers can last for at least 15 years. This usually surprised patients because when they think of porcelain, they imagine it to be a delicate material. However, when compared to tooth enamel, porcelain is actually as strong, if not stronger, than natural tooth enamel. Additionally, porcelain is naturally stain-resistant because it doesn’t share the same composition as natural tooth enamel. Enamel is naturally porous, meaning it contains many crevices for liquids to seep into. Luckily, it will be much easier to remove surface stains from porcelain veneers. What’s the Process for Porcelain Veneers? If you and your dentist agree that porcelain veneers are the right cosmetic option and that your oral health is in good condition, you can start treatment. First, they’ll discuss what your cosmetic goals are and how many veneers you’d like to have placed. Then, they’ll prepare the teeth you want by buffing down a very thin layer of enamel. This way, the veneers will sit flush and look as natural as possible next to your current teeth. Next, your dentist will take impressions of your teeth and send it to a dental lab. 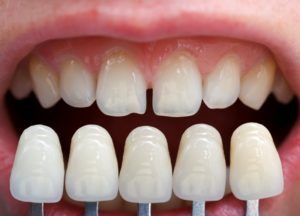 There, the shape, size, and color of your veneers will be made to fit your smile exactly. Until then, you’ll wear temporary tooth covers to protect your buffed teeth. Finally, you’ll come in for a follow-up appointment at a later date to have your permanent veneers placed. How Do I Make Them Last? Fortunately, porcelain veneers don’t require any more maintenance than natural teeth. Just treat them with the same care that you do your natural teeth and they should last you for many years before needing any replacement. Only using your teeth to chew and smile. Avoid using it as a tool to open packages or bottles. Avoid biting your nails or the tips of pens. These can damage veneers just as easily as natural teeth. While porcelain veneers in Gramercy Park won’t last forever, they can last a very long time with daily oral care. To learn more about the process, schedule an appointment with your dentist today! Dr. Ira Newman earned his Doctor of Dental Surgery degree from the Emory University School of Dentistry. He’s instructed on restorative dentistry previously and is a member of the Academy of Cosmetic Dentistry. To learn more about your cosmetic dentist in Gramercy Park, contact him through his website. Comments Off on Learn if Porcelain Veneers in Gramercy Park Permanent Today!